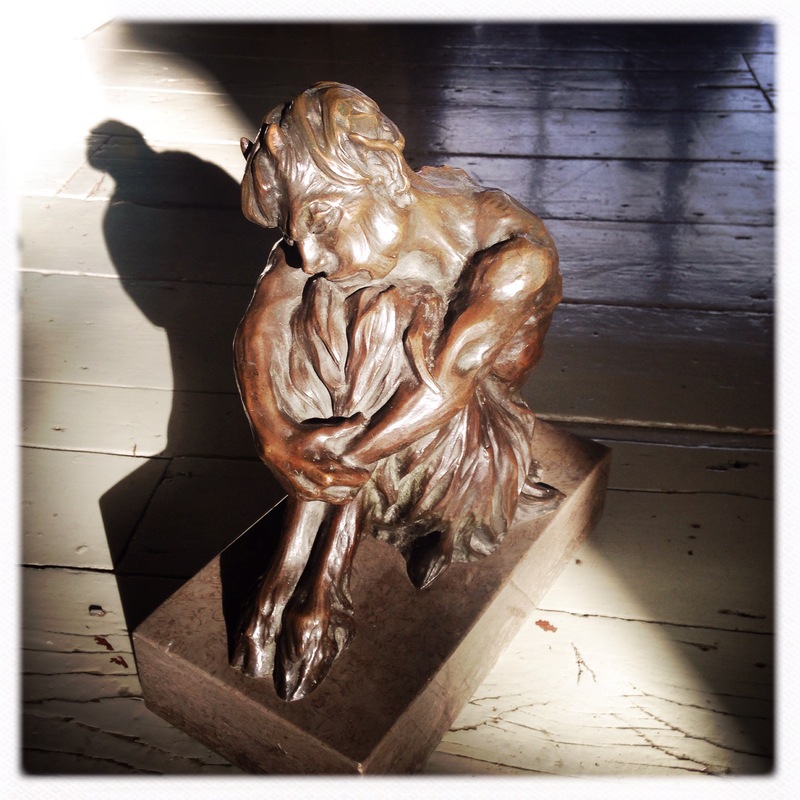 Simon Costin, art director and curator, on his bronze satyr. SC It’s often hard to explain why a certain object has a unique fascination. Is it the design or form of manufacture? Perhaps its rarity or the fact that the creator was a person of note? Maybe the object has a history, a wonderful story woven through time, which lends it an aura, like a religious relic? Or sometimes, just once in a while, something comes along that hits you in a place you never knew you even had. A place in both the mind and the heart. My satyr is one such object. Twenty years ago I was strolling along Columbia Road flower market in London on a sunny Sunday morning. I was with friends and they had wandered ahead a little. The crowds of people in the market make it easy to lose people temporarily. I stopped to see if I could see them and my eyes turned towards a shop window. Sitting there was a small bronze figure clasping his knees, his face turned in contemplation and eyes cast down. As I stared at him I noticed that he had the shaggy flanks and cloven hooves of a satyr or faun. This was no mere mortal but a representation of a God. In ancient Greek Mythology a satyr was the companion of Dionysus. Early representations have them with horse like features, a tail, ears and well, other parts… The Greek God Pan has goat legs and horns and Romans later used the term saturos when speaking of the Latin faunus, so the two aspects combined. Later representations of satyrs feature the more familiar aspects of Pan with goat’s legs and horns. Pan was known for his wild, lusty, untamed nature, a God of the fields and shepherds and known for his music played on the pipes. The worship of Pan began in Arcadia and being a creature of nature, his temples were simple natural places, groves and caves. A true lover of life and the natural world. But here in a shop window was an alternative representation. Thoughtful, perhaps melancholic, pondering the unknowable but reminding us that he’s still here and still has things to teach us. At the time I didn’t have enough money to buy him but I put down a deposit and returned a week later with the cash. The most surprising thing about the piece is how much it weighs, its almost supernaturally heavy. The one thing I remember from the dealer who sold him to me was the instruction to stroke him. Bronze reacts well to the oils in our hands. Over the last twenty years I have helped to build up whatever patina he has by regularly stroking him and making sure he’s loved. He has repaid me by opening my eyes to a different way of looking at deity and our kinship with nature. GB You seem drawn to the macabre. Can something be both macabre and beautiful? SC Absolutely! But then its all down to an individual’s perception of beauty, surely? Eye of the beholder and all that? Modernism showed us that ideals of classical beauty are there to be challenged and we should embrace all forms of existence. I enjoy the transgressive nature of the macabre. The disturbing or off-kilter has always held a fascination for me because its always been something lurking on the edge of my vision. I’ve a sunny disposition by nature but there’s always been the feeling that everything could just go up in flames at any minute. I was born in London and have lived here all my life. I’ve been here when riots have erupted and when terrorists have bombed. I went to see the buildings in the city directly after the 1993 IRA bombing. It was all so surreal. I had been past the exact same spot the day before on a bus but here it was in ruins. And the strangest thing of all was how beautiful it looked. The scale of transformation was breath taking. Horror and beauty combined. GB You seem so involved in telling stories through your work. Does the story of the satyr appeal to you? SC I think what the satyr represents is appealing, yes. I’m the director of the Museum of Witchcraft in Boscastle. The museum houses the largest collection of witchcraft-related artifacts in the world. We not only look at witchcraft but also magical practice. Britain has an enormously rich history of magical practice, from Anglo-Saxon Sorcerers to the stories of Merlin and on to Dr John Dee, Queen Elizabeth’s magician. Robert Fludd in the seventeenth century to Aleister Crowley, Dion Fortune, Ithell Collquhoun and so many others in the twentieth. The figure of the half man-half goat was demonised by the early church and became their Satan. I’ve always thought this such a damaging thing. A satyr represents our kinship with the natural world. The church saw humanity as being above nature and that legacy is what we are now having to live with as our planet struggles to support us and all the damage we inflict on it. Pan reminds us that we are not removed from the natural world. I’ve often thought that my wistful satyr seems to be sad with the knowledge of this dislocation. GB You collaborate a lot in your work. Do you ever discuss beauty specifically? Your work with Tim Walker is incredibly beautiful. SC You know I can’t ever recall having had a single conversation about the nature of beauty with anyone within the fashion world. I’ve talked to artists about it certainly, but not people in the fashion industry. Tim has a very particular aesthetic, which is why he is so successful. He has a singular vision of the world and has been able to play that out in the pages of the worlds most looked at magazines. Like any great artist he has tried to stick to his guns and fight for what he wants and how he sees things, but what makes him remarkable, I think, is how he can collaborate and listen to others. He’s not a dictator. On a shoot with Tim we are all wrapped within his vision and everyone has their role to play in helping to create that vision. It’s the same with all fashion photographers but Tim always acknowledges it. GB How do you work around clashes of taste when you’re collaborating with someone? SC That rarely happens to me thankfully. If someone chooses to work with me it’s usually because they like the worlds I create, so we are already half way there. The only time it has happened is when moneymen, they are usually men, don’t understand the vision, lack any kind of aesthetic or cultural understanding and are totally visually illiterate. It doesn’t happen very often but when it does… a deep breath and a lot of explaining, trying all the while not to be patronising, is the order of the day. Painful! GB You set up the Museum of British Folklore. Are these artefacts more interesting to you than anything in the contemporary art world? SC The museum world and the contemporary art world are two very different things. One deals with the impulsive, intuitive experiences of groups of human beings and the other deals with the rarified and usually intensively meditated-on work of a single individual. Very different things. For me the museum is so important, so broad and so revolutionary in terms of current museum practice that there’s not an hour passes that I’m not thinking of it. Setting up a national museum for the UK is such an insane project after all. But, folklore has been so long overlooked, misunderstood and marginalised, that I almost feel like a lone voice desperate to bring all our wonderfully rich folkloric culture to the fore. But I’m far from being alone. It runs through our lives in ways people don’t recognise, from street slang to urban myths. We construct ritual and give it meaning everyday in response to fundamental human desires. We have constructed wayside shrines ever since the first traveller was killed on a road and we still do it when a bicycle is painted white and chained to the railings close to where a cyclist was killed. The Museum of British Folklore will reflect what it means to be human in the 21st century and will draw on the customs and traditions of the UK to show the world the things we hold dear and how they resonate in the wider community and the commonality we all have as human beings. GB You take very local stories and use them to influence shows with global appeal – such as your recent work with Gareth Pugh. Do you think the references get lost in translation – or is that part of the beauty of it for you – the creation of something fresh and mysterious from this obscure beginning? SC I was delighted when Gareth said that he was using British Folk customs as a source of inspiration. I don’t think it particularly matters that not everyone will understand the references. A new audience has heard that there is relevance to folklore that they may never have thought about before. I love the fact that the Minehead Hobby Horse and Mummers tatter jackets have been reinterpreted. It won’t affect those particular events in any way I imagine but it may bring a handful of people to explore them in some way and learn more about them. Of course if we had a museum of folklore people could visit it and learn so much more. SC Beauty can literally take the breath away. I think the experience of beauty is always intensely personal. Many years ago I was in Rome and got up early to go for a walk. I turned a corner and there was a small square. A fountain played in the centre, lazy birds strutted around and the light was so beautiful. I stood there and tears streamed down my face and I was shocked at myself. Where the hell did that come from? That’s what beauty can do, take you by surprise and fill you with a vision of life that floods you with happiness so intense it’s almost too hard to bear.